Hair loss is a common problem affecting both men and women. The most frequent problem is androgenetic alopecia, but other causes of hair loss such as trauma, various dermatologic diseases, and systemic diseases can cause alopecia. The loss of hair can have profound effects on one’s self-esteem and emotional well-being, as one’s appearance plays a role in the workplace and interpersonal relationships. In recent years, many things changed. So, therefore, choosing the right hair restoration process can often be difficult for those suffering from hair loss. In general, people often have to choose between a hair transplant or hair replacement. There are a lot of misunderstandings surrounding the different hair restoration treatments – what is the difference and which one is better? Hair transplant surgery has made significant strides over the past 25 years that has resulted in highly satisfied patients. The movements from mini- and micro-grafting techniques to the now standard follicular grafting techniques have resulted in more aesthetically pleasing and natural appearance of transplanted Hair. While the strip technique is the most practiced method of donor harvest and today follicular unit extraction – FUE is gaining popularity these days due to no scar mark leave behind it. In this surgical procedure, it involves taking hair from one part of the scalp and transplanting it in another; where the hair loss is evident. This is obviously going to be fairly expensive and you are also going to need plenty of your own natural hair to enable the process to be carried out effectively. 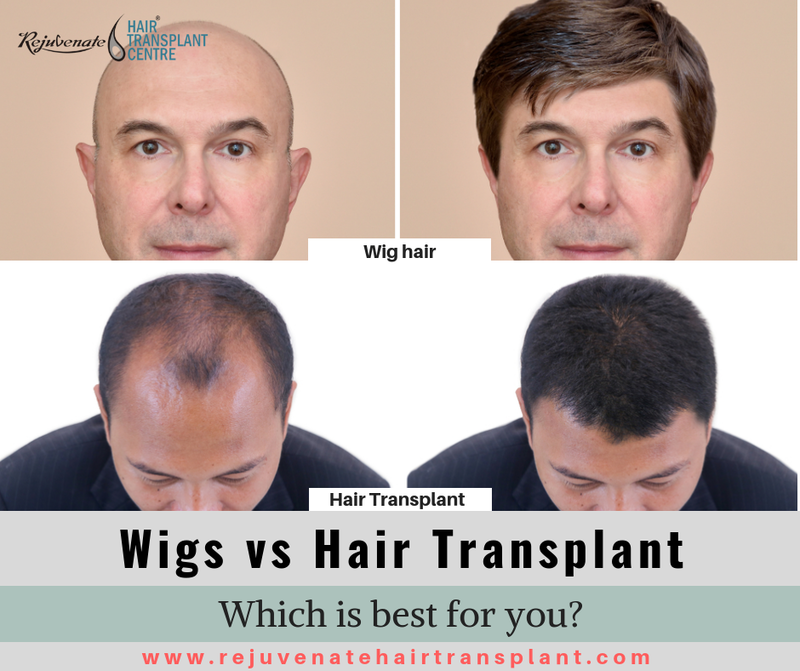 In some cases of scarring alopecia where hair transplant is contraindicated than hair replacement in the form of wig or patch will be the only answer and these patients can use wig as an alternative option. There are men and women who suffer from genetic/hereditary baldness will mostly prefer to hair transplant surgery. Generally, surgical hair transplant will take you several hours, involving anesthetic to partially numb the scalp and removing a strip of hair follicles which are then dissected and implanted into small incisions made on the scalp. With hair transplant surgery, it may take six months or longer to see the results you desire in terms of hair density. Wigs are also known as Hair Replacement System to some people. Due to some improvements in materials of hair, it is also known as “hair system”. It is a quick way to give people natural looking hair. You can choose any color, style, density, texture or length for your hair system that will come ready styled and ready to put in place. As it is the instant solution for the person who is suffering from heredity hair loss, a medical condition, chemotherapy or another reason. It is an affordable alternative but if you really want a natural hair then hair transplant is the only option. However, wigs may also have drawbacks for certain patients, such as ongoing maintenance costs. Typically, wigs will need to be serviced regularly since natural oils and other debris can affect their cleanliness and appearance. Some patients find that wigs are a convenient and interchangeable solution that allows them more freedom. How a hair replacement system is made? Actually, there’re many different materials used in its construction. A base and the hair are the main parts. A base is a part that actually comes into contact with your scalp. And generally, it’s made from a lace or polyurethane material. And the hair is made from either synthetic or human. It is tied or sometimes injected to the base material for a completed hair replacement system. Many people opt for wigs when they lost their hair. This seems like an affordable and quick idea for covering bald scalp. But the fact is that it offers you completely unnatural look. A person who wears wigs can easily be noticed by his friends and other people. No matter how expensive hair wigs you purchase, it doesn’t offer you an unnoticeable appearance. The basic purpose of hair surgery is to restore your lost hair back. You get your own hair which color and look exactly matches with existing hair. Thereby, you always get a very desirable natural look. Wearing hair wigs seems like a good option but you always know that this solution is temporary. You won’t be able to wear them for a lifetime. This seems like a burden to you. In addition, you can’t wear the same wigs for years, you must change them over-time. This means that some additional expenses are also out there. Once you undergo a hair surgery then next amazing thing you would get is permanent hair restoration. In another word, you don’t have to spend money again and again as you will have restored your lost hair permanently. Why Wigs are not Worth it? Wearing a wig all the time make you discomfort and it not good for your scalp also. When you cover your scalp most with your wig then you may face skin problem. So, in short – It not good for your scalp hygiene. If you are not bald completely and wear a wig frequently then may be your natural hair can be damaged due to breakage or thinning which are caused due to tight braiding. Totally a temporary solution, as it is a quick fix to cover up your bald spots, no matter how much one invests in it. It looks unnatural. Need regular maintenance and expense increase with that also. Wig will not be easy to wear if this is the first time to wear a wig. It will take a longer time to wear as compared to your natural hair.